My hero, Fred Kirby, with my brother and sister, Tony and Janie, and some kid that is not, but should have been me! Who are your heroes? As a little girl, my hands down hero was a singing cowboy named Fred Kirby. A staple for all baby boomers throughout central North Carolina, Fred Kirby and the Little Rascals aired for years Sunday afternoons on our local Charlotte station WBTV, Channel 3. They were all local stations back then. Fred Kirby sang all of my favorite songs. Who can forget Jimmy Crack Corn, The Big Rock Candy Mountain and his classic, Atomic Power? In addition to those classic scenes playing his guitar and singing, Fred Kirby rode his horse Calico while his side-kick, Uncle Jim, entertained us with his classic buffoonery. The show also aired short clips of “Our Gang”, The Little Rascals. Who can forget Darla and Alfalfa, the Buckwheat and throaty voiced Froggy? Who can forget the classic and completely politically incorrect episode when Uncle George broke out of the nuthouse and chased the Little Rascals around for their candy saying “Yum, yum. Eat’em up!”? In the end, the Rascal’s are saved by little Spanky who shot Uncle George in the arse and out the window with a roman candle? My hero, Fred Kirby, had a long career in the entertainment industry and entertained generations of children before and after me. 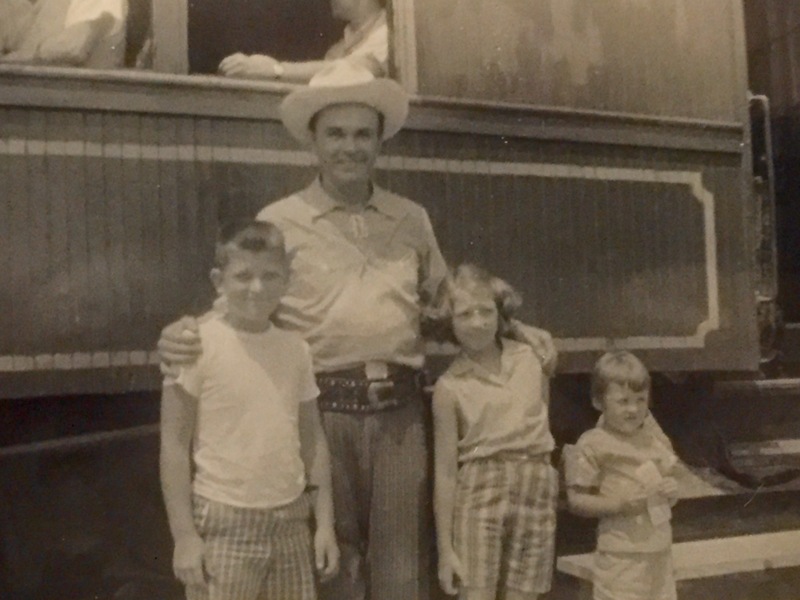 He faithfully wore his cowboy hat and red cowboy shirt with white fringe and made summer and weekend appearances for years at a local attraction in the mountains near Boone NC called Tweetsie Railroad. It was a highlight of my preschool years when mama and daddy took me to Tweetsie to see Fred Kirby in person and ride the train. Numerous times a day, the old steam engine, Tweetsie, wound its way for several miles through the Appalachian mountains where it would invariably be attacked by Indians. On the day we made this classic trip, one of the Indians decided he was going to pretend to scalp my mama. It was classic “Mur-Louise” when she fought back and hit him in the head with her pocketbook. Ultimately, we all came out alive when the cowboys came to our rescue. These days, there are very few characters on my television set that are worthy of being cast as heroes. Even our old friends Batman and Superman are squabbling between themselves. I have to ask, really, is it worth those paltry millions to further confuse the next generation of kids as to which of these guys are the good and which are the bad guys? Doesn’t that generation have it bad enough? There’s my neighbor Janice who has faced numerous difficulties including the tragic loss of her son, Deebs, years ago. I recently learned that every year, she and her ex-husband visit her son’s elementary school and tell the children her son’s story. Every year in May, she courageously reopens those wounds and has to find the strength to heal again. For her courage to continue to stay open to love despite the pain it costs her, Janice is my hero. There are my cousins Glenn, Julia and Alex who after the loss of Glenn’s mother (my Aunt BJ last summer) are now courageously fighting Glenn’s aggressive stage 4 cancer. Cancer has totally changed their lives but they are committed to doing everything possible to wage war on this brutal disease. The stress it puts on them as individuals and a family is great but they do it with faith and grace. For this and the love they continue to share with others during their own difficult times, Glenn, Julia and Alex are my heroes. There are my friends Linda and Tracy who over the last five or six years suffered unexpected, mid-life breakups of their marriages. Through their experiences, I have learned that divorce is much more than the breakup of a marriage. It is the dissolution of a family unit. It is a complete loss of trust between individuals. It is the death of a dream. To watch them come out of those dark times to create even stronger, better and more authentic lives is nothing less than awe- inspiring. Linda and Tracy are my heroes. There is my young friend who was a drug addict. After many years, she found the strength to come clean and she lives her life today in recovery. As a single mother, today she works two jobs to support her family. She is dedicated and tough. She is compassionate and makes time to help others. This friend knows who she is. She is my hero. My list of heroes could go on and on. Today’s real-life superheros do not need to don a cowboy hat or wriggle into spandex to assume their magic powers. Everyday, they get out of bed, put one foot in front of the other and bravely do battle.